Former world No. 1 Maria Sharapova makes a triumphant return to Grand Slam competition after a 15-month doping ban, beating second-ranked Simona Halep 6-4, 4-6, 6-3 at the US Open. Maria Sharapova serves to Romania's Simona Halep during their US Open women's singles first-round match at the USTA Billie Jean King National Tennis Center in Flushing Meadows, New York, on August 28, 2017. The Russian upset her second-ranked rival 6-4, 4-6, 6-3. Former world No. 1 Maria Sharapova made a triumphant return to Grand Slam competition on Monday after a 15-month doping ban, outlasting second-ranked Simona Halep 6-4, 4-6, 6-3 at the US Open. The 30-year-old Russian, who had only one hardcourt tuneup match due to a nagging forearm injury, swatted 60 winners with 64 unforced errors, setting the tempo and baffling Halep at times in a tension-packed thriller at Arthur Ashe Stadium in New York. "This girl has a lot of grit," Sharapova said of herself. "And she's not going anywhere." Sharapova, who tested positive for meldonium at last year's Australian Open, improved to 7-0 in her all-time rivalry with Halep, extending her mastery over the 25-year-old Romanian. "I just thought this was another day, another opportunity, another match but this was so much more," Sharapova said. "You sometimes wonder why you put in all the work and this is exactly why." After the final point, Sharapova dropped to her knees in tears as a replay appeal showed what she already knew. She later battled back tears as she blew kisses to spectators, sobbed at times and mouthed "Thank you" to fans that were devoted throughout the 2-hour, 45-minute drama. "You never know what you're going to feel until you win that match point," she said. "It was so worth it." It was Sharapova's first Grand Slam match since a quarterfinal loss to Serena Williams in last year's Australian Open. Asked about her low points, Sharapova, said, "There were definitely a few but I don't think this is the time to talk about that." 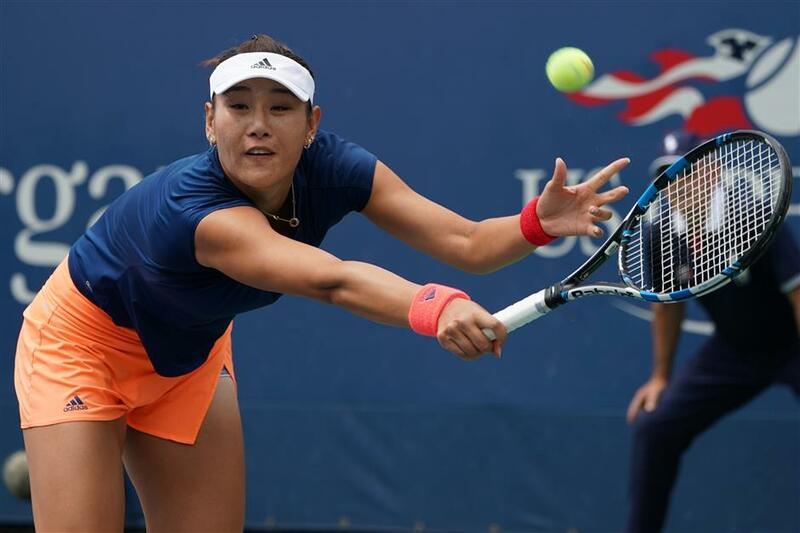 Duan Yingying of China returns the ball to Claire Liu of the United States during their first-round match at the US Open in Flushing Meadows, New York, on August 28, 2017. Duan won 7-6 (8), 7-6 (3). Sharapova walked onto the court at Arthur Ashe Stadium to rousing applause. She wore a black dress, visor, socks and shoes, the same style she sported in taking the trophy nine years ago on the New York hardcourts. Halep hit a backhand long to hand Sharapova a break and 2-0 lead in the last set and the Russian held to the finish, escaping a break point in the final game when Halep netted a forehand. A Sharapova backhand winner set up match point and brought huge applause but a thunderous ovation came when Halep hit a forehand long to end it, boosting Sharapova to 18-0 in night matches at Ashe. "It's prime time baby," she said. "I love it." Reigning Wimbledon champion Garbine Muguruza advanced and British seventh seed Johanna Konta was ousted in other women's matches. Spanish third seed Muguruza defeated American Varvara Lepchenko 6-0, 6-3. Muguruza can reach the US Open third round for the first time by defeating China's Duan Yingying, a 7-6 (8), 7-6 (3) winner over American Claire Liu. "Coming to US Open and having a dark past in the results, I keep it with low expectations," Muguruza said. Serbia's 78th-ranked Aleksandra Krunic upset Australian-born Konta 4-6, 6-3, 6-4, removing the only other top-10 player from Sharapova's draw quarter. "It's definitely not an easy loss to take," Konta said. "She played consistently much better than I did." German fourth seed Alexander Zverev, the top-ranked player in his half of the draw, saved two set points in the first tie-break and downed stubborn Barbados qualifier and Slam debutante Darian King 7-6 (9), 7-5, 6-4. Croatian fifth seed Marin Cilic, the 2014 US Open champion and last month's Wimbledon runner-up, ousted 105th-ranked American Tennys Sandgren 6-4, 6-3, 3-6, 6-3. "I feel just a little bit rusty," Cilic said. "I need a few matches to get into the rhythm."